The Industrial Development Board (IDB) of the City of Oak Ridge is a non-profit, public corporation organized under the Industrial Development Corporation Act of Tennessee as set forth in the State statute. 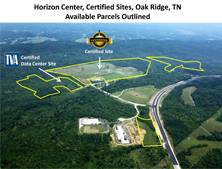 The sole purpose of the IDB is to acquire, own, lease, and dispose of properties in order to promote industry and develop trade by attracting manufacturing, industrial and commercial enterprises to Oak Ridge. The IDB offers several industrial incentives such as PILOTs (payment in lieu of taxes), TIFs (tax increment financing), Grants, and Industrial Revenue Bonds that can help facilitate local expansion and new development. The Board is comprised of nine (9) members. Members are elected by Council for six-year staggered terms of office. Five (5) members constitute a quorum and the concurring vote of a majority of those members present at a meeting is required for board action. The Board typically meets on the first Monday of each month. View Our Listing at The Horizon Center Park. Copyright © 2019 oakridgetn.org. All Rights Reserved.